Tag Archive | "Foremost Farms"
A Greenville property has been purchased by Foremost Farms for a dairy processing facility. The 96-acre property is currently vacant, Foremost indicated in the press release. Whether the announcement slows plans for a cheese plant envisioned by Michigan Milk Producers (MMPA), Dairy Farmers of America (DFA), Foremost and Glanbia, one thing is expected: if the Foremost plant is built, it will absorb nearly all of Michigan’s current milk overproduction. By taking another 6 million pounds per day of milk from Michigan dairy farms, the planned plant will certainly help farmers, and not just Foremost members, said Chris Wolf, professor of agriculture economics and dairy expert with Michigan State University. “More processing means less dumping and less distressed sales,” he said. “And we know that Greenville is close to a lot of milk in Clinton, Ionia and Gratiot counties, and it’s not too far from the highway,” he said. “I wouldn’t advise anyone to begin adding cows, but this plant could take a lot of excess milk. Our milk production growth is slowing, but we’re still growing at about 3 percent above national growth. I think this plant is very good news as long as it doesn’t mean something bad for the cheese facility. If we keep growing in milk production, one plant may not make much difference, but it’s good to take the portfolio approach and have multiple things to address the overproduction.” Ken Nobis, president of the MMPA, agreed. While dairy farmers will need to exercise some patience while the Foremost plant and a cheese plant moves forward, there is hope for a better future in dairying, said Chuck Courtade, director of customer relations with DFA. 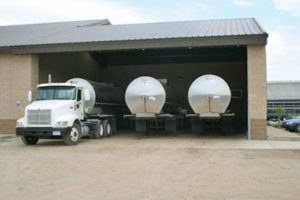 Courtade said when both the raw milk plant and a cheese plant are up and running, dairymen could expect a pay increase. It’s been a long wait, but between Foremost’s announcement and the apparent commitment to a cheese plant in the near future, farmers, and especially Foremost suppliers, are anticipating better times that are nearer than they thought just a few months ago. “Between the two plants, we should be able to even handle some normal growth,” Courtade said. Among the things that remain unclear is whether the cheese plant will have Foremost involvement. Mihm would not rule out that co-op’s continued involvement with a cheese plant in Michigan, but she said for now, Foremost is excited for its new unilateral Michigan venture. “We are incredibly energized by this,” she said.